The BiPAC 8800NL is an all-in-one small footprint VDSL2/ADSL2+ broadband router with high-speed 802.11n wireless technology. It supports all UK networks regardless of connection type, working with ADSL2+, VDSL2 (FTTC), Fibre and Cable technology making it an ideal device for customers with BT Infinity, Sky Fibre, TalkTalk, Virgin Media, Plusnet etc. Users can enjoy ADSL2+ and VDSL2 services and broadband multimedia applications such as interactive gaming, video streaming and real-time audio much easier and faster than ever before with the renowned Broadcom chipset. The BiPAC 8800NL complies with VDSL2 and ADSL2+ worldwide standards and it can support the downlink data rate of up to 100Mbps and uplink data rate of up to 50Mbps in VDSL2. It supports SNR adjustment on ADSL for greater stability, especially important on long lines, and vectoring on VDSL lines. It can also be used in modem mode only (PPPoA half-bridge mode or PPPoE bridge mode) for use in front of a dedicated firewall. It’s also integrated with 3-port 10/100Mbps switch, 1-port Gigabit switch, and 802.11n wireless AP, enabling users to connect to multiple computers or devices easily. The BiPAC 8800NL has four LAN ports and the fourth port can be configured as a WAN port if required. 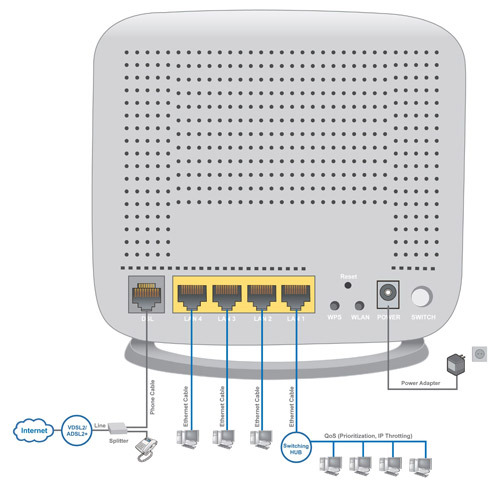 This EWAN (Ethernet WAN) port offers another broadband connectivity option for connecting to a cable or fibre modem. 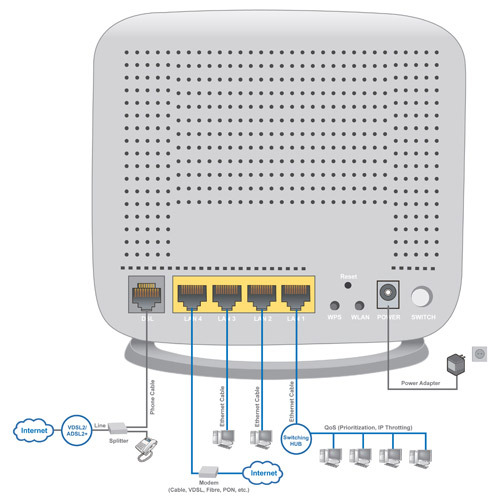 SOHO or small office users can even deploy the BiPAC 8800NL for FTTx (Fiber-to-the-building, node, or home) applications over a fibre device connection. With an integrated 802.11n wireless access point, the router delivers up to 6 times the speed and 3 times the wireless coverage of an 802.11b/g network device. It supports a data rate up to 300Mbps and is also compatible with 802.11b/g equipment. The Wi-Fi Protected Access (WPA-PSK / WPA2-PSK) and Wired Equivalent Privacy (WEP) features enhance the level of transmission security and access control over wireless LAN. In addition multiple SSIDs and Time Scheduling functionality allows for flexible management of internet access for guests and kids through the web interface, and there is also a hardware wireless on/off switch. The BiPAC 8800NL supports multi-functional USB 2.0 port. You can share FTP, NAS, DLNA media server and files with your family throughout your home network. 1. The router may require firmware modification for certain ADSL2/2+/ Annex M DSLAMs.